These kneeboards are covered with soft, leather-like material and feature a wide leg strap to hold the kneeboard in place during flight. 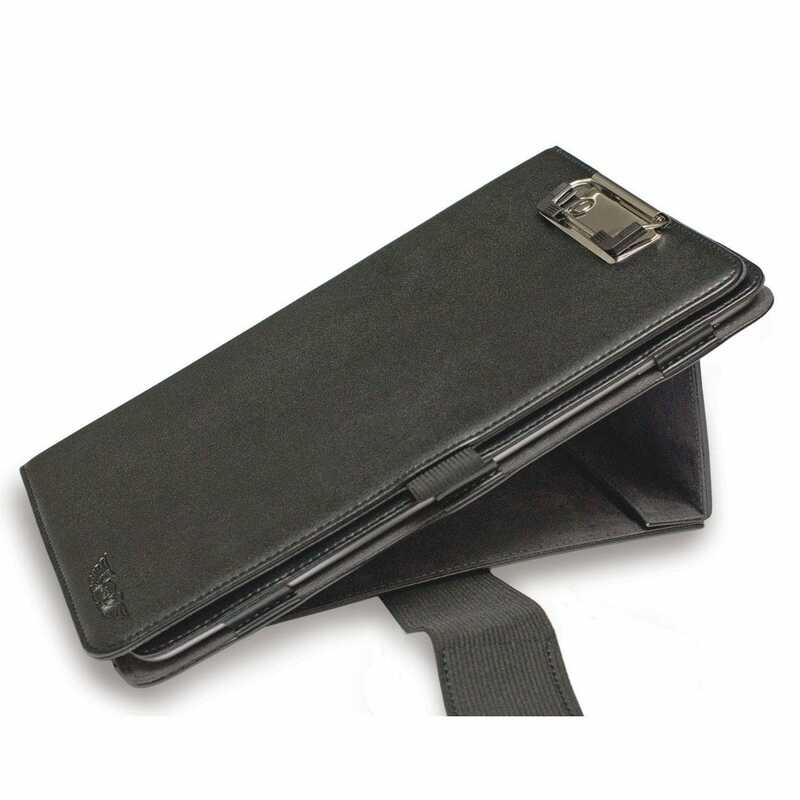 A holding clip on the front provides a place to secure a notepad or other paper documents you might need to reference. 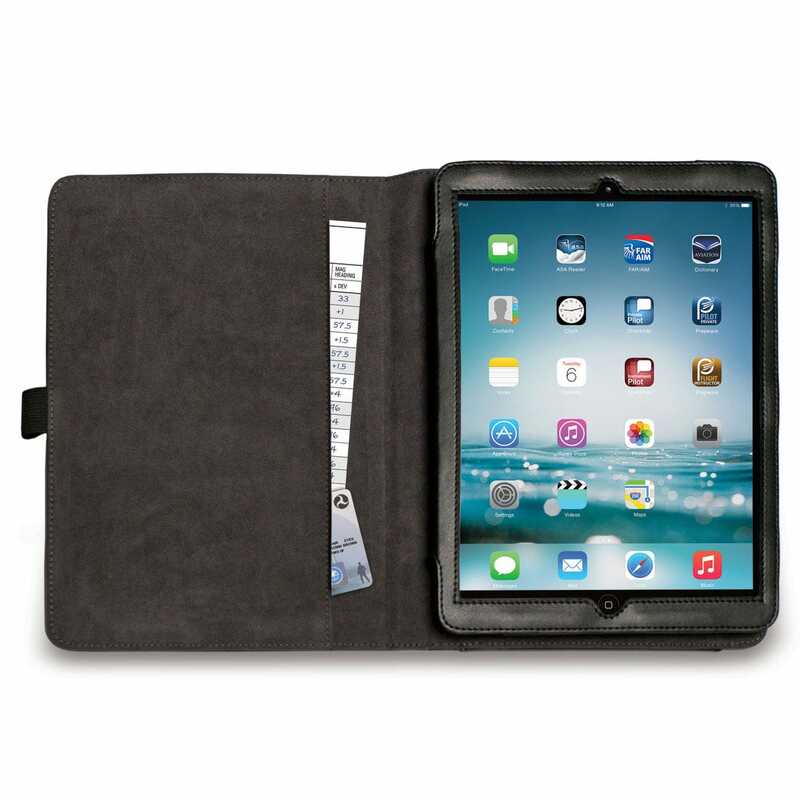 Inside, the kneeboard is covered with a soft microfiber to protect your iPad. The built-in adjustable easel provides tilted viewing angle. The power port is accessible with the cover closed and a back cover window exposes the camera lens for easy picture taking. Fits iPad Pro 9.7", iPad 2017,iPad Air 2019 and iPad Air 1-2, without cases. Will not fit original iPad 1-4. Fits iPad Mini 1, 2, 3, 4 and 5 without cases. The holder itself for the iPad is to big for the iPad mini4 , it slides around and the home button and screen sides cannot be touched when using foreflight . Overall design great but practical for flight I would say no! I use my iPad primarily for ForeFlight. As such, I need to have full access to all of the display area. The front leather frame of the clipboard covers a significant portion of the left side making it difficult to access (or see) important links or information. The bottom cut-out, while making it possible to navigate between programs, is such that thumbprint log-ons are virtually impossible. I've tried it now on two flights (~8 hours total) and while the build looks sturdy, I find that it is just in the way. It's good quality, but it doesn't fit my iPad Pro 10.5" very well. I will still use it until I find one that fits better. This case does not protect the edges of your iPad from damage. 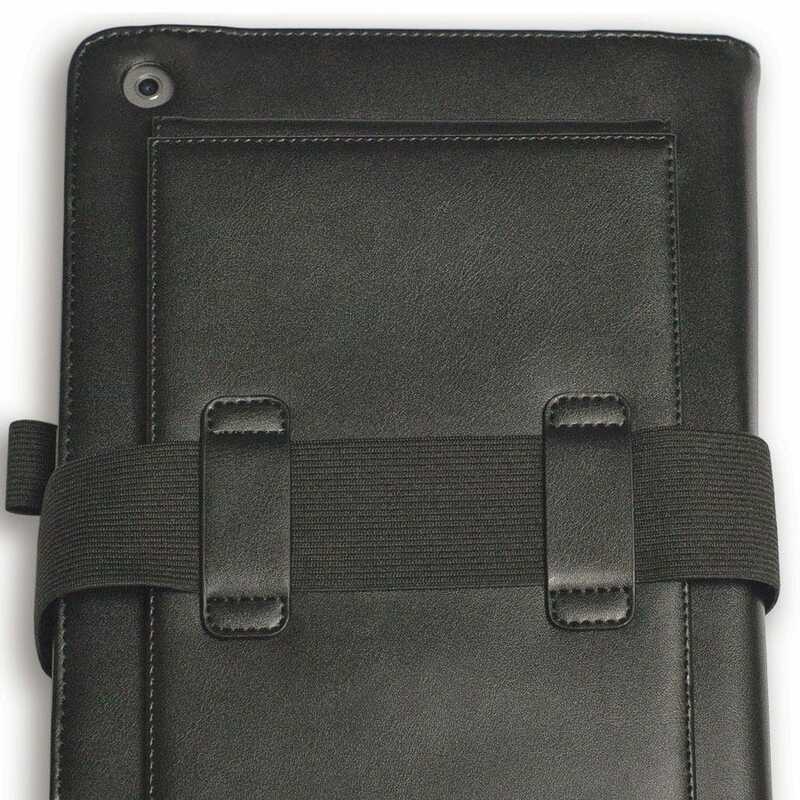 The fake leather feel is really nice and the interior of the case feels great, but the cover is stiff, so it does not easily fold down the side of your leg when you have the cover open to use the iPad. The description says it fits the iPad 10.5 pro "snugly." This is false. The case fits EXTREMELY SNUGLY and covers the home button, making it impossible to unlock your iPad without sliding your finger underneath the bottom edge of the case. Would probably be a good choice for an iPad air as it is designed for. I like it, but it is a serious hindrance that it doesn’t have the magnets needed to do the sleep/wake function for the iPad 5th gen. This is a serious fault that has caused a loss of battery on long flights. It is also a little bit loose on the iPad but so far, the iPad fits somewhat well and it protects it well. This simply does not fit an iPad pro. Yes, you can wedge it into the kneeboard, but the "home" button is blocked. Its just not a match. It's a nice kneeboard design but I feel misled by the statement that an Ipad pro could also fit. This is good cover for your iPad out of the cockpit, and would be perfect in the cockpit - IF I could see the entire screen or access the the buttons on my iPad Pro! It would be a great product for an older iPad, but if you have the new iPad Pro, the leather covers too much of the device to be functional. This is THE BEST ipad kneeboard I have ever had. I've had just about every type of kneeboard sold. And this one takes it. It is just the right size for small airplanes. None of all that extra pockets that you don't kneed and just cause clutter in the cockpit. The quality is top notch and for the price it can't be beat. I have used it with the ipad and without the ipad just as a note taking kneeboard with its built in clipboard for writing down long clearances and taxi instructions. And its size is perfect. Pen holder is nice addition as well. The case is built well, compact, and comfortable. However, it didn't end up working out for me. I have an iPad mini 4, which is thinner than the previous 3 generations. 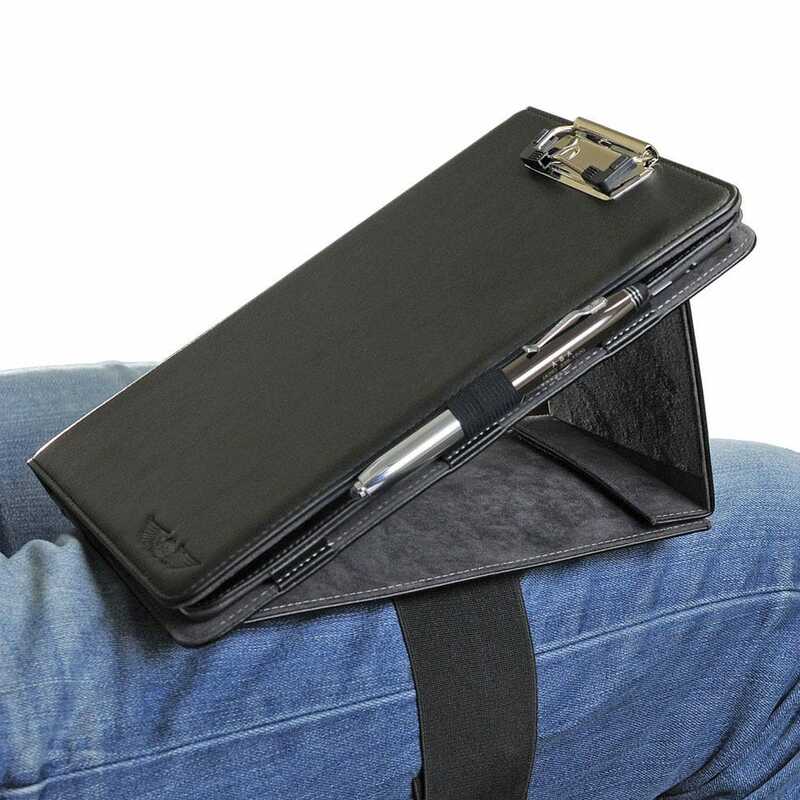 This case/knee board is really made for versions 1, 2, or 3 of the iPad mini. With my iPad, the device slid around in the case, the Touch ID was almost unusable, and the case blocked the auto-brightness sensor causing the screen to go nearly black. If you have a iPad mini 3 or older, this case could work great for you though. Just be mindful that you can't tuck the cover behind the device; it has to hang off the side which could cause issue for stick-controlled planes (Diamonds, Cubs, etc.). Know your device, your preferred leg for strapping, and your airplane before buying this case! The iPad mini 4 is much thinner than the 2 or 3. Will the mini 4 fit snuggly in this kneeboard? BEST ANSWER: It will technically "fit." But, it is by no means snug. I had to return the kneeboard for this reason. The device will slide around inside the kneeboard. Apple also moved the ambient light sensor on the 4 and this particular kneeboard covers the sensor causing the screen to go dark unless you deactivate the automatic brightness. The Touch ID is also difficult to access with this case as well. iPad Pro 10.5 will fit here? The 10.5 will fit but it is tight. I have a Samsung Tab-A, its just a tiny bit bigger than the latest Ipad mini. A fit? BEST ANSWER: Yes, it should fit. Does the leg strap dethatch from the case for use outside the cockpit? BEST ANSWER: Yes! The strap is attached to the back of the leather kneeboard through two leather straps. The leather attachment straps are a bit snug to the leg strap, so it may be a bit of a chore to fit them back in. The velcro on the leg straps are fairly low profile and can easily slip under the attachment straps for removal. The leg straps are a bit long for my legs, so I may be looking at a way to shorten the leg strap. Yes the strap is removable and I use the it as an everyday case for the Ipad. Yes the strap is removable. Does this have multiple positions for tilting or just one tilt position? BEST ANSWER: It has a single position for tilting. Will this fit the 6th gen 9.7”? BEST ANSWER: Yes, it will fit the 6th gen 9.7. Any chance ASA will be releasing a version of this kneeboard for the iPad Pro 2 10.5? I have tried this version but the home button is hard to access as well as the edges of the screen being partially covered due to the smaller bezel. I would really like a kneeboard which had a clipboard clip for paper notes as well as the iPad. BEST ANSWER: I am not sure. Please check our website for new products. Will this knee board hold an iPad 12.9 ? Will this fit an IPad 4 ? BEST ANSWER: This kneeboard will not fit the iPad 4. 1) how well does this protect against fall damage? 2) if the fall protection isn't that great, are there any cases that will fit inside the kneeboard? 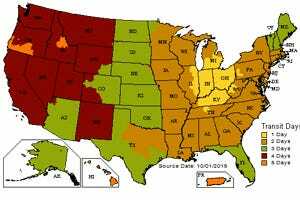 BEST ANSWER: This case offers very little fall protection. 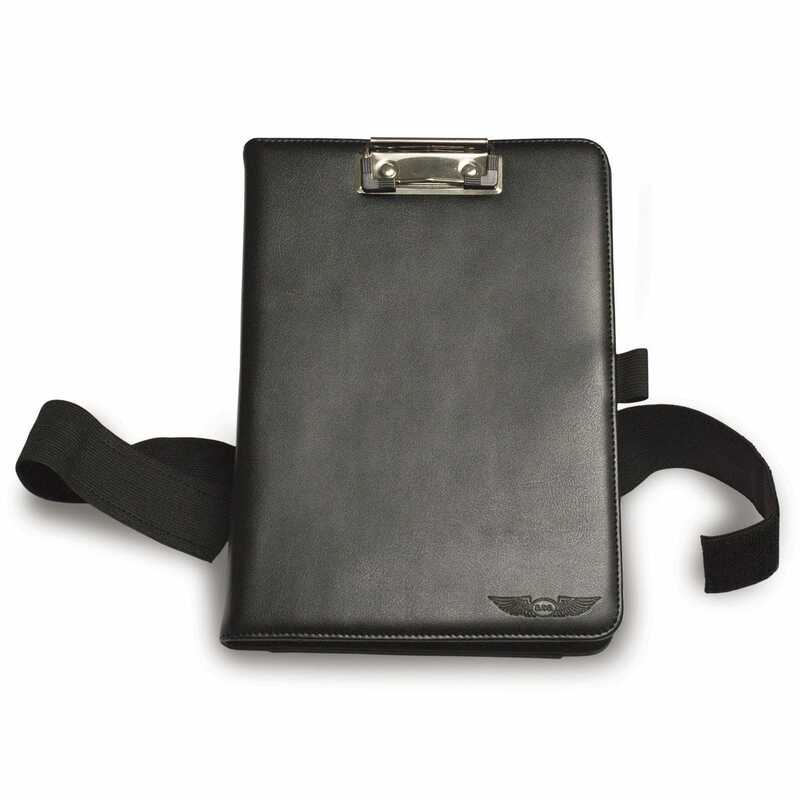 Our item 2810A will allow you to use the iPad with a case that is not too large. Can you please provide weights for the ASA iPad Kneeboard 9.7" Pro and their competitor Flight Gear HP iPad Kneeboard? BEST ANSWER: The asa kneeboard weights approx 1.5 lbs. The HP is currently out of stock but should weigh about the same. Does this allow rotation to landscape orientation? BEST ANSWER: This case does not allow for rotation to landscape. It does tilt up. The mini 4 is a tad larger than the mini 2 or 3. Will this ASA kneeboard still fit the Mini 4? BEST ANSWER: Yes it Will still fit the iPad mini 4. Would this kneeboard would allow me to use a lifeproof case for my ipad mini 2 and still fit into the kneeboard? BEST ANSWER: Probably not - that's going to be too thick. I have an iPad Air 2, which of your models accommodate that Air 2?? 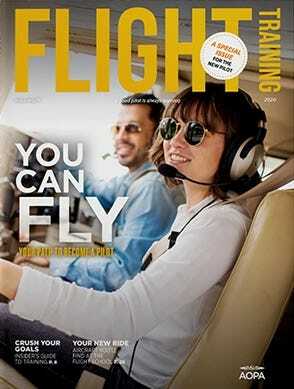 BEST ANSWER: This would accommodate the Air 2, as would the Flight Outfitters, MyGoFlight and Flight Gear kneeboards.